Fishing on Lake Manitoba is for the professionals. I’m no professional fisherman, not even an amateur, not even a fisherman. 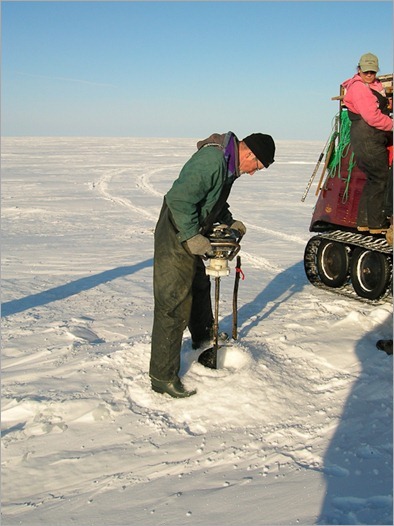 As said in the previous post about Ice Fishing on Lake Manitoba at The Narrows, you need some serious tools in order to get yourself a chance to get some fish for supper. 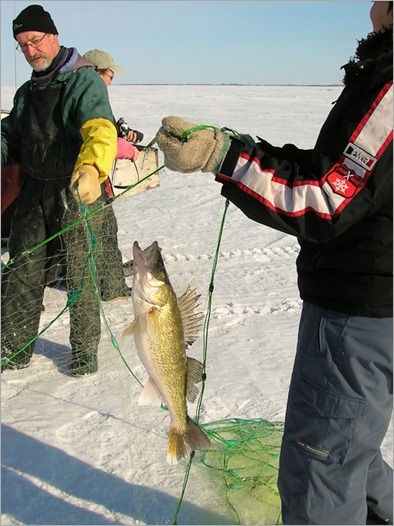 And yes, the material we used to go fishing one morning on Lake Manitoba was almost as old and aged as in this picture. Want to see some more? Lake Manitoba has shores that are in some places more than treacherous, let’s call them outright dangerous. In summer they are swamps with mosquitoes you would expect to be as big as seagulls. The mosquitoes are small, so small you hardly feel them, until they take a bite out of you, that is. In winter the ice is not always thick (enough) in all places. To go fishing by yourself, you need a fair amount of material, and that does not come cheap. At least if you want to have a chance of catching something. So we decided to go with a professional fisherman and see how he went about it. With the hope of stealing his ideas and do the same thing for ourselves. Hope shattered at first sight. 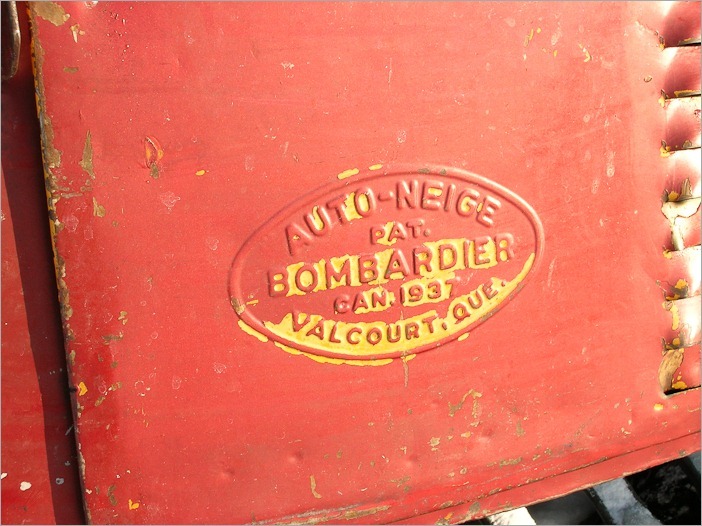 The vehicle you see here is a professional rescue vehicle made by Joseph-Armand Bombardier (see page about 1940s). Bombardier today is responsible for the Olympic Torch, vintage 2010, among other things. 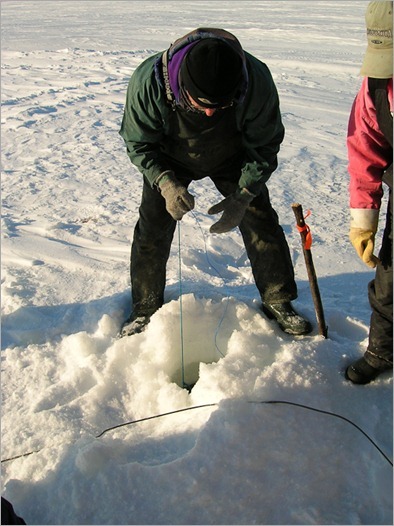 Once on the ice you have to find your nets to get the fish, so you need holes. Holes are made with a power auger, not the flimsy hand augers they sell in the shops. 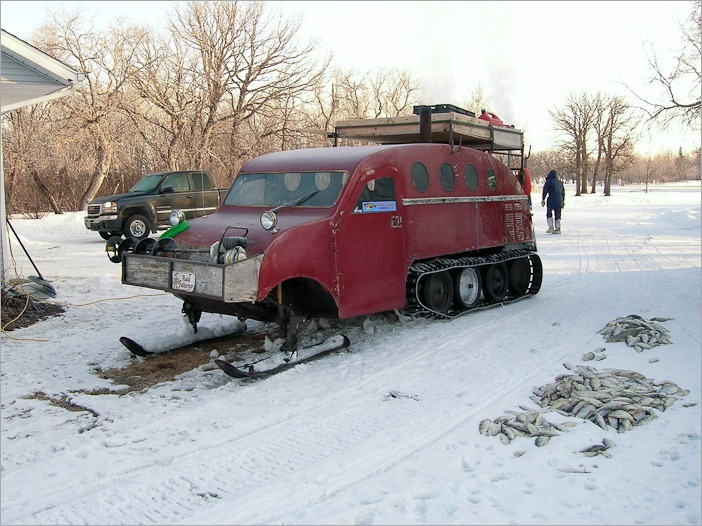 The auger used here is a LOT bigger than the one used for our little trip on the Red River a few weeks ago. And fishing here goes with a net and not with a single line. Since this is our host’s primary income, he uses good material and a sure way of getting his income the way he wants it and as fast as possible. The nets had been placed the previous day so that we would really have some result when getting them out of under the ice. And yes, the nets were full of fish, some great fish and a lot of non-sellable fish. 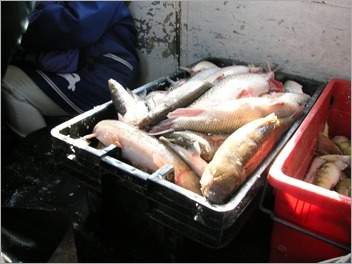 The good fish goes straight into the cases in the Bombardier, the rest was to be left right there. Some of it was to come back home and be used as dog food. It appears dogs will eat it without trouble. A nice twist was that the “tulabi”, fish with a lot of fine bones, was collected by one of our co-visitors and later frozen and distributed among the poor people in Winnipeg. In the soup this fish will still have great taste but at least you can filter out the bones with a strainer, once boiled. And get some real fish for free is always a good thing if you don’t have enough to feed your family. To finish with the same picture as last time, this is the good fish from the catch. One of the cases, anyway. The fisherman works only during the winter months when the ice is thick enough and does no fishing in summer. All of it good enough to give him a good life near the lake.